We're fighting back - find out what you can do this week. It is vital that you call your Senators (see numbers below) to let them know that this GOP health bill is unacceptable and that you expect them to use whatever means possible to prevent this bill from passing. We're now seeing signs that the RNC is pumping up Issa's efforts using social media (see details below on what you can do). For a perspective on the Ossoff loss, see the Indivisible Guide response here. Reminder: If you attended the first Membership Meeting, please take the time to complete our survey. The hand-outs are available here. 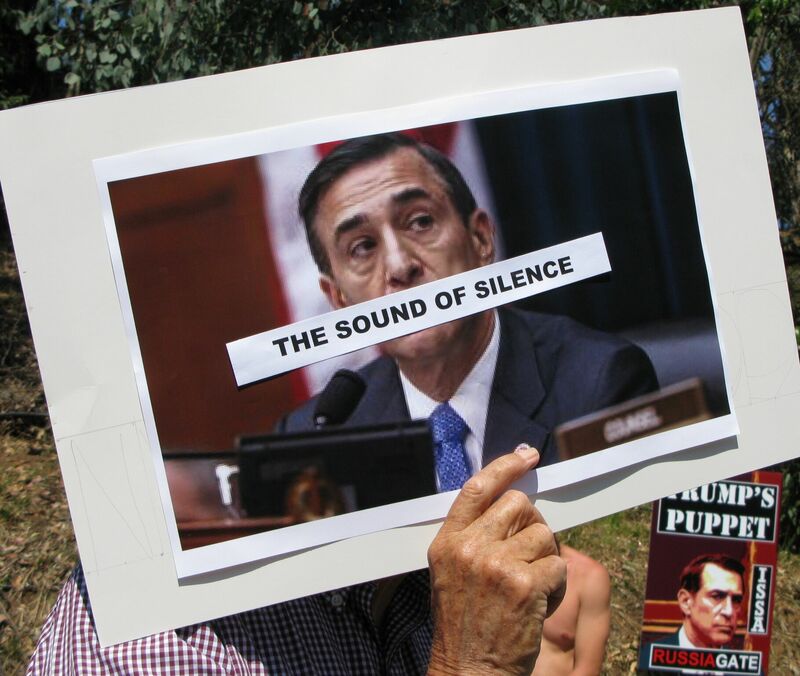 Issa’s silence on critical issues was on display this past Tuesday, June 20. He mocked us the previous week - “They’re pathetic. There were almost none.” This week, we showed him we have staying power, even during the summer, with 300+ protesters. Let's keep showing up!! See more photos for the rally. Tuesday, June 27: Rally in Vista - "Our Dreams for America"
Since we are not having a rally on July 4, let's have a 4th of July theme this week. What better week is there for focusing on our dreams for our country? Health care for all, immigration rights, clean air and water - the list is endless, isn't it? We will make videos of your dreams and send them to Issa's office. We'll also ask you to write postcards to him. Send Ellen an email if you'd like to speak this week. Otherwise, we'll see you this Tuesday. Bring your friends, your signs and your energy! For more details and RSVP, click here. On Sunday, July 2nd, we march to demand Congress DO THEIR JOB and remove Trump from The White House. The future of American Democracy rests in their hands. Details here. GOP Senators will try to push through their irresponsible health care bill this week. Crafted in secret by male GOP leadership, the bill will shape one sixth of the American economy and has had no congressional hearings, not received a budget score and was hastily crafted behind closed doors. Shame on the GOP! Five GOP senators currently publicly oppose the bill - three of those believe that the bill is not conservative enough. Let's continue to press our Democratic Senators to do anything and everything they can to stop business from moving forward in the Senate and oppose this bill. We still have an opportunity to change the outcome - if not for yourself, then for the millions of poorer and older Americans, veterans and people with disabilities this bill will affect. This bill will affect Employer-sponsored health care benefits as well! Make your voice heard! Top action: call your Senators every day to fight AHCA with everything they’ve got. Looking for something more to do? Here's the Indivisible Guide Stop TrumpCare Toolkit. The RNC, RNCC, and Special Interest groups are now moving financial support to the Darrell Issa re-election campaign and efforts. Their first priority is Social Media. Operation Veracity has been tracking Issa’s online activity since January, and is now seeing an up-tick in movement and social interaction. Please counter Darrell Issa's fact-free comments posted via his Twitter and Facebook accounts. We recommend posting news articles (along with your personal comments) on Issa's social media pages that state the facts about TrumpCare. His support for this policy is what has many of his supporters upset, let's make sure they do not forget.